I am a full-time mom of two who enjoys creating in many forms: cooking, sewing, writing, photography. This blog is a personal challenge to document my adventures in family and creativity. 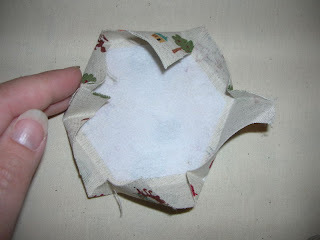 After looking all over for a cute hexagon shaped needle case tutorial, I kept coming up empty. I started by making this one, which was inspired by one I saw in a magazine but it was really fussy and I didn’t like all the thread globs from starting and stopping the stitching. 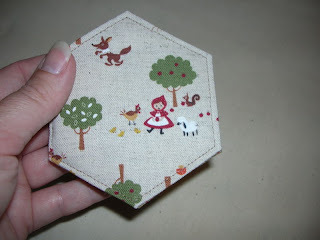 I was looking for a clean simple design – just like the hexagons I’ve been piecing! So after a few more attempts, I came up with this. 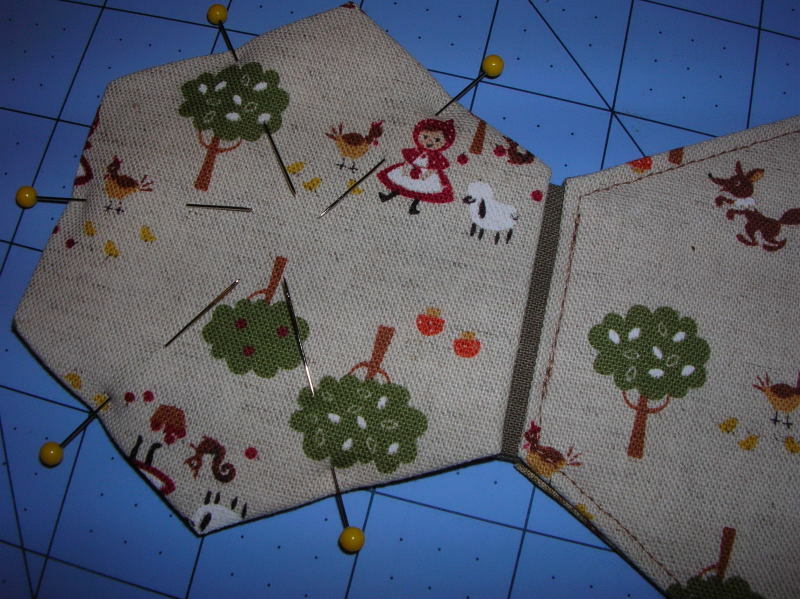 It’s not too fiddly, is quick to come together and you’ll have a cute needle case when you’re all done! Bear with me – this is my very first tutorial. Felt: one piece approx. 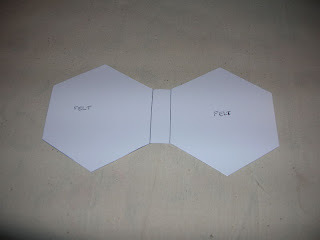 7" x 3.5"
First, let’s make the hexagons. We need to make four hexagons: two with the outer fabric and two with the inner fabric. You can baste the hexagons using the 2 inch templates as a stabilizer (just like regular paper pieced hexagons) or you can join the Lazy Crafter’s Club and just press them around the template, which is what I do. 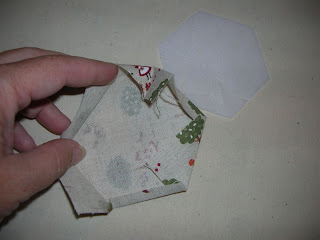 Once you have your four hexagons be sure to press them well so that they will hold their shape and have nice crisp edges. 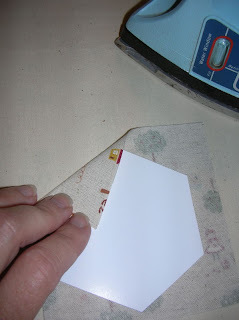 Remove paper templates, if using. Gently open up the outer fabric hexagons and place one of your fusible interfacing hexies inside, fusible side down. I actually cut mine down to be a little smaller than 2 inch hexies so it's easier to fit them nicely inside there. Carefully fold back the edges so that you have a nice tidy hexagon again. Press well. Repeat for the other outer hexagon. Next, take your 1.5” x 5” piece of inner fabric (or whatever you’re using for your hinge piece (mine is a scrap of brown linen/cotton) and press ends under (1/2 inch) and then press in half so that you have a piece that measures 1.5” x 2”. Use this template to cut out your felt. Yay! 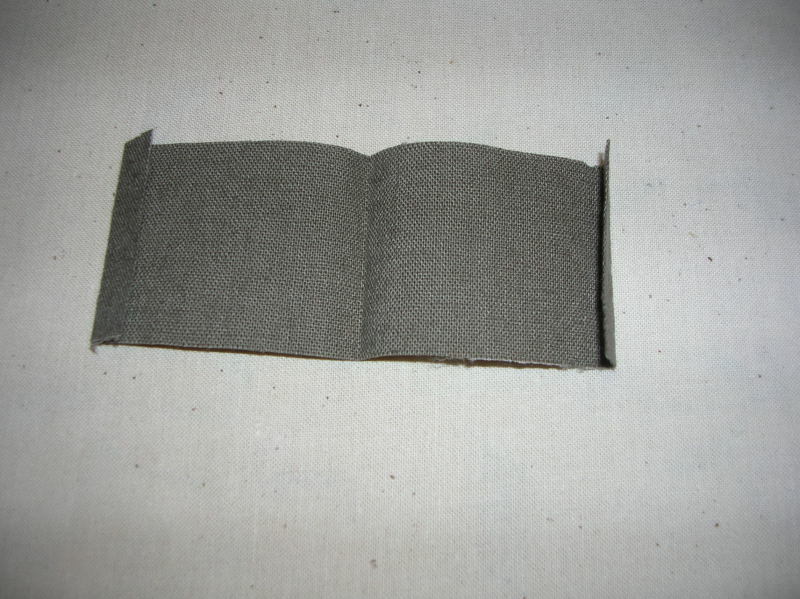 You now have all the pieces needed for your needle book. Let’s assemble! Take one outer hexie and one inner hexie and sandwich them wrong sides together. I put one pin in each side to hold everything so things don’t get shifty. On the side where your needle book will fold, tuck your hinge piece in about 1/2 inch. 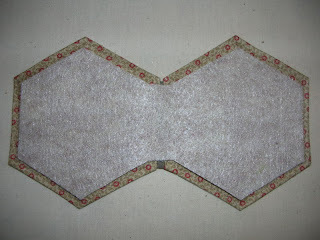 Sew along the edge all around the hexagon sandwich. 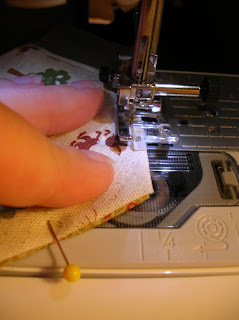 Keep your stitching very close to the edge. Almost done! Take your felt and center it inside your needle book. 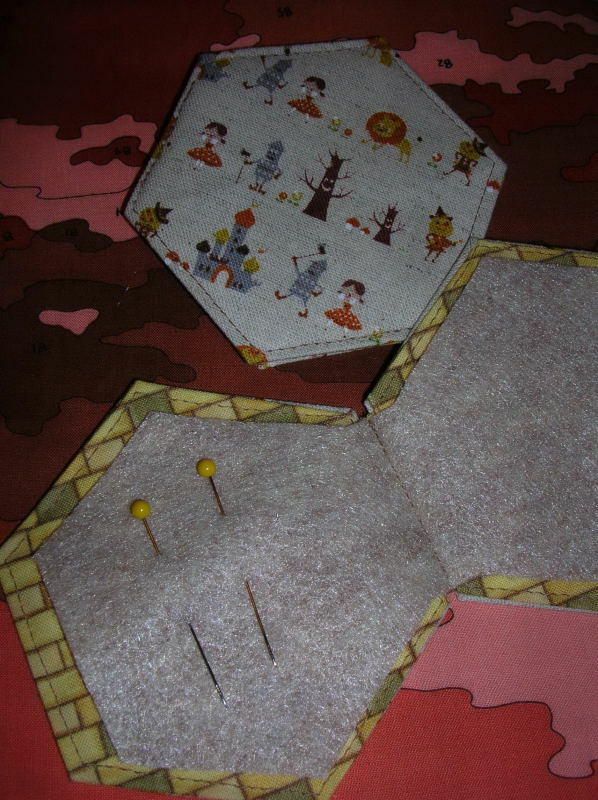 Stitch along the center attaching the felt to the hinge. That's it. You did it! 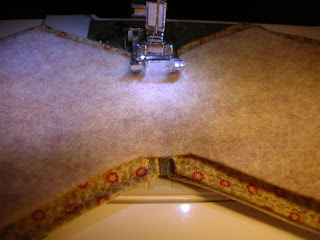 Admire your fabulous new needle case! If you make one, I'd love to know! Great Tute Megs! I love this little needlebook, I think i'll be making one for myself, and maybe a few more as gifts for some crafty friends!! This is refreshingly straightforward and so perfect - thanks for sharing it! I have to make this one for sure!!! 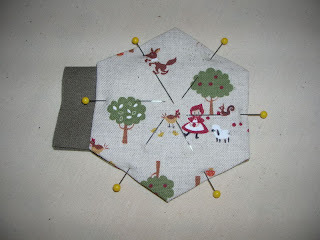 My mother-in-law will really like this because she is always carrying needles along with her sewing projects! Thank you, Megan! Super cute and very clear instructions. 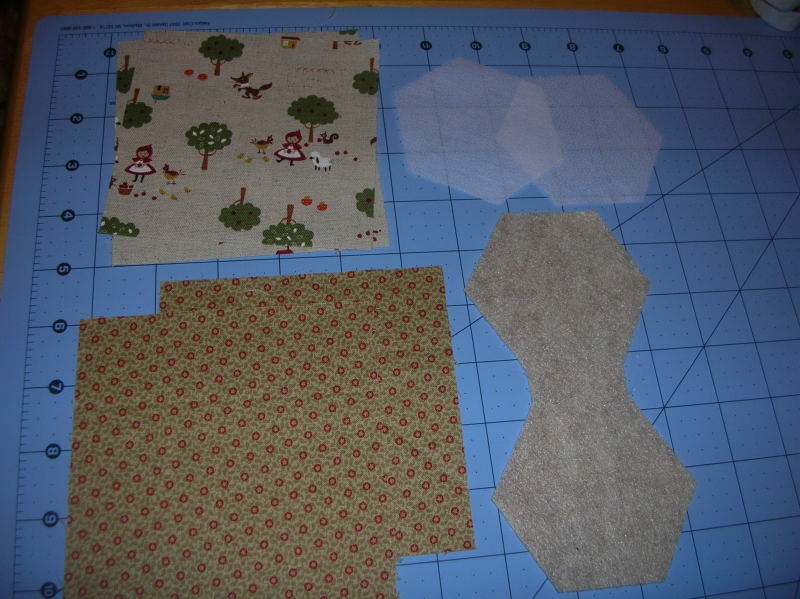 Now to find some adorable fabric! Love this! 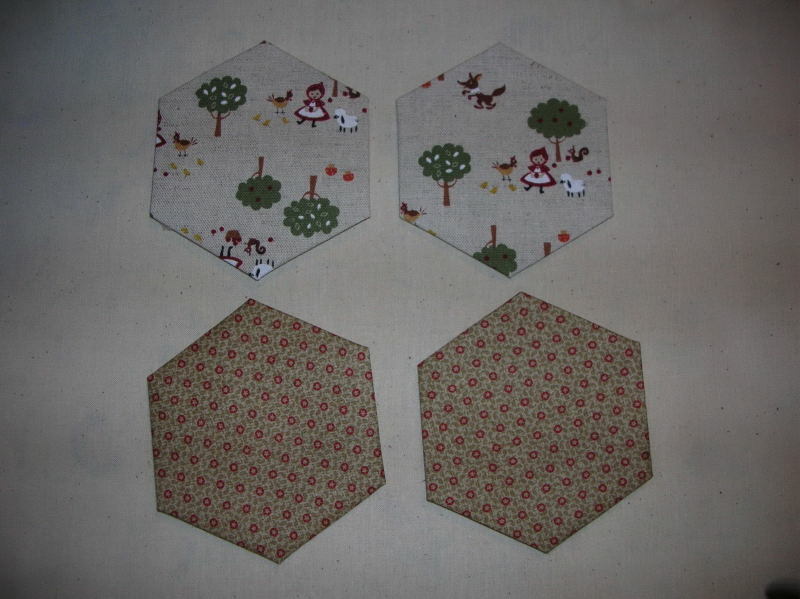 It will be great for carrying around with my hexies waiting to be sewn. ;P TFS! This is so cute! I went to my stash immediately after reading your very clear directions. Thank you for sharing! 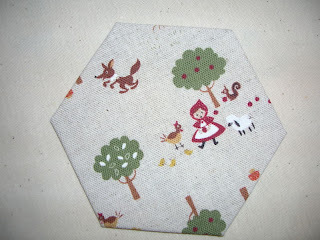 Thank you for sharing this pattern!! 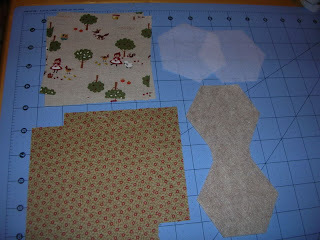 I have some cute material and am going to try making one today. I love it and it was so simple. Thanks a million! I love reading your comments and answering any questions. Thanks so much for stopping by and spending some time here! These are the little monkey beans that make it all worthwhile. This is a Flickr badge showing public photos and videos from megsmonkeybeans. Make your own badge here.